What Is Necessary For A Dental Crown in Yuma? Dental crowns have been available in Yuma for a long, long time. But would you believe the procedure itself has been around for a thousand years or more? Ancient dentists used ivory, bone, and seashells to make crowns for teeth. Evidence of gold crowns dates from 200 A.D. Porcelain crowns appeared in the 1800s. With the advancement of metal casting processes in the 1900s, crown technology took a big leap forward. First, the tooth is anesthetized and then prepared. All decay is removed and the tooth is shaped. Usually, the dentist files off tooth structure to reduce the size and create the proper shape. Sometimes, the tooth is too small to begin with. In that case, the dentist builds up its core with filling material to design a durable base for the crown. All-metal crowns—as opposed to porcelain crowns—have thinner sides, requiring less removal of tooth structure. The dentist will use a putty-like substance to create an impression of the tooth and surrounding teeth. An impression will also be made of the teeth that oppose the crown. This ensures that the crown does not negatively affect the bite. A temporary crown is used to safeguard the tooth and be certain it doesn’t move in the mouth while the permanent crown is being created. Patients need to be careful with their temporary crown. It is not as strong as the permanent crown and is attached only with temporary cement. Avoid chewing gum and eating sticky foods. Be aware that the tooth may be sensitive to hot and cold. If the new crown will be constructed with porcelain, you and your dentist will use a shade guide to select a shade for the restoration. Most patients don’t have teeth that are exactly the same color. You will need to ascertain the most appropriate shade to blend in with the surrounding teeth. The dentist or a laboratory technician uses the model to build the crown. Some dentists have the equipment needed to manufacture crowns right in their office. 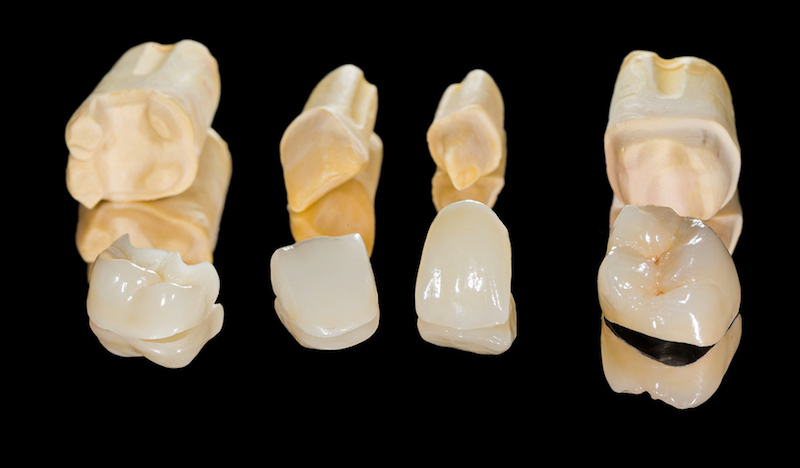 Same day restorations are created with a machine that mills a crown from a small block of ceramic in the correct shade. When the new crown is ready, your dentist places it in your mouth and makes any needed modification to attain a great fit. This process shouldn’t be rushed. Sometimes less than a millimeter of drilling can make the difference between an ill-fitting crown that makes irregular contact with the opposing teeth and a crown that is accurately fitted. The Yuma Dentist provides dental crowns and implants, along with other cosmetic and general dentistry. Call our office today for a consultation or an appointment. Today’s message looks at one of the miracles of modern dentistry: the dental restoration. Let’s pretend you are a biomedical engineer working in the field of dentistry before the introduction of dental restorations. The men and women of your generation who have missing or damaged teeth want to repair or replace them with a man-made substitute. You have been hired to find or create a material that can be used to engineer fillings, crowns, and dental bridges. Consider the physical and chemical requirements of this incredible item. It must sustain forces of 162 pounds per square inch (PSI), hundreds of times a day – day after day, year after year. It must be resistant to cracking and chipping. But there’s a catch regarding its strength; it must not hurt the enamel on opposing teeth. This material must also maintain its size and shape and be resistant to shrinking. It must be bondable to living tooth structure as well as other materials required for specific appliances. It must be biocompatible with the soft tissues in the mouth as well as tooth enamel, dentin, and bone. It can’t trigger allergic reactions in the wearers. It must be corrosion-resistant to the chemicals in saliva, foods, and beverages. It must resist infection regardless of ever-present bacteria in the mouth. And it can’t contain toxic chemicals that could be absorbed into the bloodstream. And we haven’t even touched on the esthetics yet. Ideally, this extraordinary material would be indistinguishable from genuine teeth in color, opacity, and translucence. Of course, we know that such an entity exists because dental restorations have been around for a long time. At this time, there are multiple materials used alone or in combination including porcelain, ceramic, and metals such as gold and silver amalgam. Though the metals are uncommonly strong and malleable, they don’t meet some patient’s esthetic requirements and are used mainly for back teeth. I wonder if the ancient Chinese porcelain originators who developed the techniques for molding, firing, and painting the beautiful tableware and vases prized around the world ever imagined that their invention would live beautifully in the mouths of millions of men and women more than twenty centuries later! Yuma Family Dentist offers sedation dentistry, Invisalign, cosmetic dentistry, teeth whitening, and dental implants. For more information, call Yuma Family Dentist today at 928-783-0804 or visit https://www.yumafamilydentist.com. 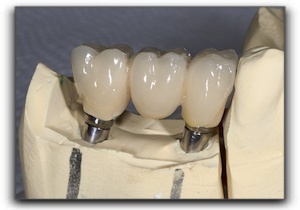 Today’s post looks at the complex process required to construct a dental crown. Dental crowns can be constructed with metal, ceramic (porcelain), plastics, or varying combinations of these. We will describe the process used to create a porcelain crown, though the steps are similar to those used for other materials. Modern porcelain crowns are a technological and artistic marvel that make successful reconstructive and cosmetic dentistry possible. This picture shows three crowns attached to two implant posts. While the most advanced AZ dental lab techs and skilled ceramists can’t make a tooth as strong as Mother Nature can, they are getting pretty darn close. When one of our Yuma Family Dentist patients needs a crown, a dental assistant makes an impression of all the teeth. The impression is sent to a laboratory where the plaster teeth are separated. The individual tooth mold in need of restoration is scanned into a computer to have the perfect dimensions to send to the factory. The state-of-the-art factory has a computerized machine that will then pour plaster into cylindrical molds, making blanks. Once hardened, the process of making the tooth from the plaster blanks begins. The machine then takes the scanned data from the impression and begins milling out the contours found in the scan. The finished tooth is not to scale, being 20% to 30% larger than needed. This enlargement is to allow for material shrinkage that will later occur. The machine then dips the plastered tooth into liquid ceramic. The ceramic hardens and gives the tooth a glossy, natural finish that is indistinguishable from a genuine tooth. The machine then starts a new process of orienting the tooth with others. This time, ceramic powder is poured into new molds over the plaster tooth. The molds are put on a rod and then plunged into a water-filled chamber. Once the chamber lid is closed, water pressure increases, solidifying each ceramic tooth. The restoration is then chiseled to perfectly match the plastered tooth that is inside. This tooth becomes the ceramic shell of the crown and is easily lifted off the plastered tooth. This shell, or coping, will then be exposed to a high temperature for increased durability. It also shrinks to the proper size when exposed to the high temperature. Once finished, a plastic replica of the original tooth is created from the computer scan. The new shell is then tested for precise fitting over the tooth. The shell then leaves the factory for the lab, where layers of colored porcelain are painted on it. A skilled ceramist – an artist in every sense of the word – may apply up to 15 layers of porcelain to perfectly match the variations in the surrounding teeth. 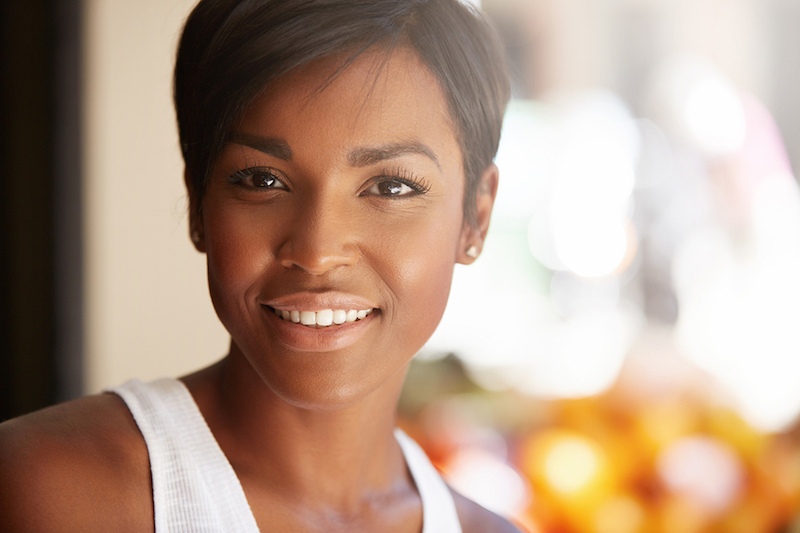 This labor-intensive process accounts for much of the cost of a high-quality crown. The crown is then fired to making the porcelain more impenetrable throughout. More hand contouring follows, as required, and then is finished with a clear, ceramic gloss. All of this work results in a terrific crown for one of our patients! If you have a broken tooth or old, unattractive crown, or want information about smile makeovers, call 928-783-0804 to discuss the possibilities. Call 928-783-0804 today for an appointment. I have fears of going to the dentist... That all changed when I went here. Excellent care and service for the entire family. My kids are now excited about going to the dentist. I have had outstanding service every time I went into the office. The Yuma Dentist, home of Yuma dentist Dr. Frank Hulme, provides exceptional cosmetic dentistry, dental implants, general and family dentistry and so much more. They even provide sedation dentistry for patients that prefer it. They serve patients in and around Yuma, Arizona, including Fortuna Foothills, Somerton, and San Luis AZ and Winterhaven, CA. Call us today!